The thing about traitors or moles is that they are often privy to the most sensitive information and you really don’t know who they are. You most likely don’t even know that you have one. Allon is generally mistrustful of the secret agencies of countries that he is expected to trust and share information. When several “sources” are killed and obvious clues point to moles in other agencies, he must find that mole and the answer may damage long-time friends; friends that he trusts and needs. 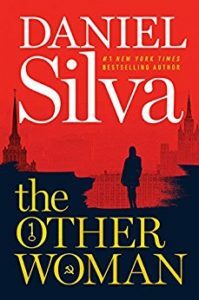 The Other Woman is another home run for Mr. Silva. A page-turner from the start and surprises throughout. I found myself deciding against sleep to finish the last 200 pages. This article was published on Aug 11, 2018 . It is tagged Daniel Silva, gabriel allon, The Other Woman. You can follow any responses to this article through the comment RSS feed.